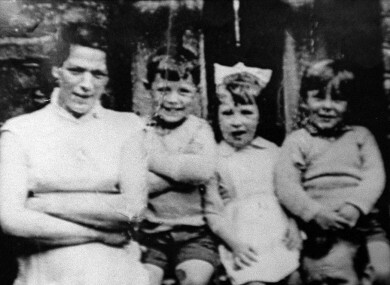 Mother-of-10 Jean McConville was abducted from her west Belfast home in 1972, and murdered. THE SON OF Jean McConville, a mother of 10 who was abducted and killed during the Troubles, has spoken about a private apology he once received from Sinn Féin leader Gerry Adams. Michael McConville was one of Jean’s children who spoke to Marian Finucane on RTÉ Radio One this morning about their mother’s death and the devastating impact it had on their family. Jean McConville, a widow, was abducted from her home in west Belfast in 1972. Her body was found on a beach in Louth 10 years ago. During the interview, Michael McConville spoke of the apology he said was made to him by Adams. Adams has consistently denied having any role in the disappearance and death of the Belfast widow. He has said he had “no act or part to play in either the abduction, the killing or the burial of Jean McConville”. He says to me for what it’s worth Michael, I’ll apologise to you… he says it was wrong, he says, for the Republican movement, the murder of your mother. He says, it was wrong of the Republican movement to treat your family and yourself the way what they did. He says, I am sorry for what had happened your mother and I’m sorry for what happened to your family. Michael said that he met the IRA on four different occasions, and asked them a number of questions. He said that they asked him did he know the people who took his mother away, and he said he did but would not give any names. He also asked them to clarify for how many days his mother was alive after her abduction. McConville’s son said that the IRA “turned around and told us to go away and write down everything on paper” that they wanted the answers for. Though there was one question left unanswered, the family learned that their mother was alive for about 12 hours alive after she was abducted. Email “McConville son speaks of 'Adams apology'”. Feedback on “McConville son speaks of 'Adams apology'”.